The two most powerful business growth tools are visible in the photo of this post. Surprised? The one is more obvious than the other and you can find it mentioned in any good leadership training material. 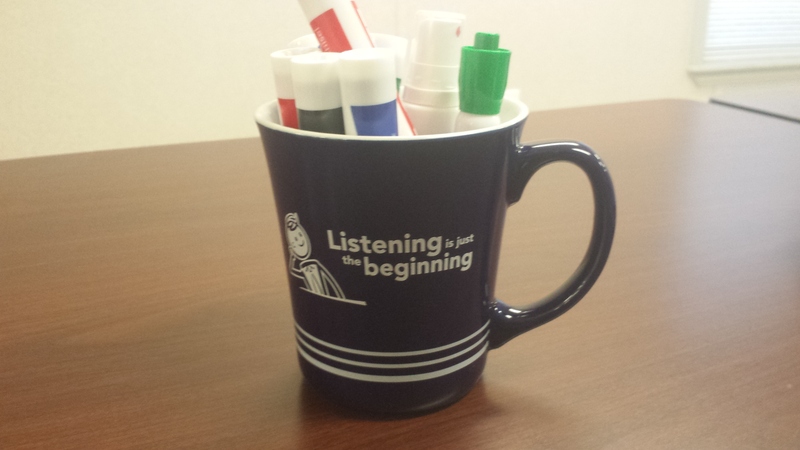 Listening is the beginning of any significant business growth. Here this can be listening to your own dreams and aspirations to begin with. Then you need to expand this to your peers and most of all listen well to the front line people. They will know best what the business needs most. The other tool may be a little more difficult and abstract to get from the photo. The dry-erase markers stand for writing down the creative ideas and thoughts. This is done through collaboration with your team(s). It stands also for generating a plan using collaboration. Tell people and you may have short-term success. Listen and collaborate and you will attract long term sustainable growth and most of all, significance. Three tools are there. The two you mentioned and the coffee cup. Thanks, John. So what would the mug be a tool of? Hi John. I will have the coffee you go for the cigar.